The conclusion of Iran’s nuclear deal exhibits a significant shift in United States (US) policy from deterrence to that of containment. Deterrence in simple terms means use of punishment (military, economic and diplomatic) to stop the adversary from taking certain kind of actions. On the other hand, containment means to stop the expansion and influence of the adversary country. Under the present context, US and Iran Joint Comprehension Action Plan (JCPOA) represent the example of the containment policy as Iran agreed to eliminate its stockpile of medium-enriched uranium, to eliminate its low-enriched uranium by 98 percent and to reduce two-third numbers of centrifuges for at least fifteen years. Even after 15 years, Iran agrees to not to enrich uranium over 3.67% and not to build any new uranium enriching or heavy water facilities. [i] This clearly shows that US wishes to limit the production capacity of Iran’s nuclear weapons program rather than to completely eliminate it. The White House also mentioned that without a deal, Iran could manufacture its nuclear bomb within 2 to 3 months. However, after the conclusion of a deal, it could not make its atomic bomb for at least 15-20 years. [ii] The question which this article address is why there is such change in the US policy - from deterrence to containment and what aims it desire to achieve. There is a lot of debates both inside and outside US about the feasibility and practicality of JCPOA. However, what has been forgotten is that containment is the only practical strategy left to the US to deal with Iran. Containment as a strategy is adopted when it is difficult to set aside the differences with the adversary, and it is also difficult to carry out the military attacks due to the costs associated with it. 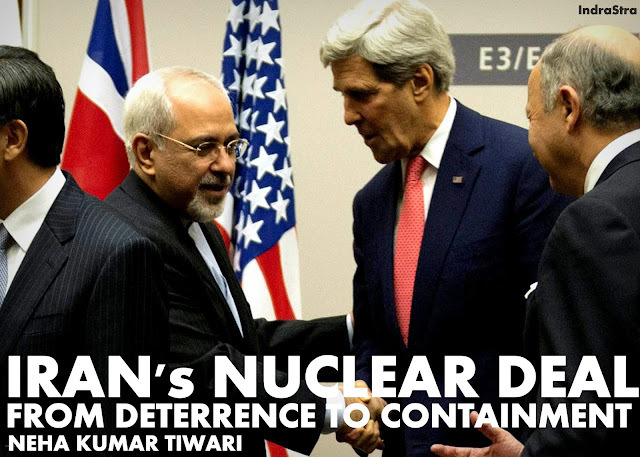 US has been following the policy of deterrence since the last decade, and it has been unable to stop Iran from pursuing its nuclear weapon's ambitions. Since the discovery of the Iran’s nuclear weapons program in 2005, several countries, including the EU, P5 and even the UN have imposed sanctions on Iran. As a result, Iran’s oil exports fell to 700,000 barrels per day having a huge impact on its economy. [iii] However, this did not deter Iran from pursuing its independent nuclear weapon's policy. There have been talks about military actions also, especially by Israel, but it also proved incapable from deterring Iran from its nuclear pursuits. In the present context, the pre-emptive strikes on Iran have been one of the options available to the US to destroy the nuclear weapons complex of Iran and to bring it under its own control. However, there are a lot of problems associated with the possibility of a military strike on Iran by US. First, the US military attacks on Iraq and Afghanistan have not been accepted by the public at large in US. This has also created a problem for the army as it was deployed on foreign soil for a long period of time. Another attack in the Middle East could bring down the popularity of President Obama and its party. President Obama has tried to change the policy of Bush administration by withdrawing troops from Iraq and Afghanistan, by making changes in the nuclear postures and by changing its missile-defense programs. Second, it is difficult to estimate the likely damage which the US could cause on the Iranian facilities as they are built underground and are specifically guarded against a destructive attack. Third, any such attacks could draw Russia in and further damage the US-Russian relations, given the fact that Russia has supported Iran’s nuclear weapons program. Therefore, Obama's administration tried to deal with the Iran’s nuclear questions by using economic sanctions. It was against the idea of a military strike on Iran, even when Israel was talking about a military strike similar to Operation Orchard to be carried out in Iran. [iv] On the other hand, economic sanctions failed to bend Iran’s nuclear programme. Therefore, US moved towards containment as a main strategy to deal with Iran. The problem is that US could not completely ignore Iran’s nuclear programme due to concerns of proliferation and due to likely reactions of allies like Israel and Saudi Arabia. A nuclear bomb by Saudi Arabia or preemptive strike by Israel on Iran’s nuclear facility could impact strategic stability in the Middle East. This deal will help pacify US allies about Iran’s nuclear programme, to some extent, without forcing Iran to withdraw its nuclear programme completely. Therefore, US seems to choose a middle way approach to achieve its aims. In this way, US has bought time from Iran to think and adopt different policies to deal with the nuclear proliferation issue. For example, soon after the nuclear deal, the US has offered to increase its military aid to Israel by $1.5 billion per year, aiming on one hand to to make Israel's defence strong while arresting the Iran’s nuclear capability. [v] Furthermore, Iran will be receiving economic benefits from US under the deal. Once Iran becomes economically vibrant, sanctions having lifted, it will be difficult for it to go nuclear and to find itself again under the umbrella of economic sanctions. Now coming to Iran, it has chosen to adopt the nuclear deal with the US because there has been a recent change in its government. Hassan Rohuani won the elections in June 2013, which implies that the public of Iran has been tired of crumbling economic situations and Iran’s confrontation with the West. Since he had taken office, he has prioritized the issue of solving the matter of Iran’s nuclear programme and to end Iran’s isolation. [vi] This nuclear deal will not only help to ease sanctions and to help Iran economically, but will also keep open the nuclear option of Iran to deal with the domestic criticism of abandoning nuclear programme completely under the US pressures. Such a measure should help Hassan Rohuani gain public support for his policies. Therefore, this results from the change of policy from deterrence to containment. The strategy of containment offers the middle way to both the sides without associating much diplomatic and political cost on each side. Without the deal, the Iran would have remained difficult to deal with as is manifest in historical experiences. This nuclear deal will surely make Iran a ‘nuclear threshold state’ but not the ‘independent nuclear-weapon state’, it may have been aiming for, which has much more costs and adverse effects on the region and also on the non-proliferation regime. Neha Kumar Tiwari is doing Ph.D in Disarmament Studies from Jawaharlal Nehru University, New Delhi. Her M.Phil topic was, “Role of Ballistic Missile Defense in the US nuclear deterrence discourse: Study of post-cold war debates.” She has been associated with Institute of Peace and Conflict Studies (IPCS), New Delhi as Research Officer from July 2007-March 2008. During this period, She worked on the issues related to nuclear weapons, missile stability, Ballistic Missile Defence and the US policies in South Asia. She also worked as a Research Associate in United Service Institution of India, New Delhi.